Germany: The Nazis win 230 seats in the Reichstag and becomes the largest party in Germany. Spain: Day 15 of 985 of the Spanish Civil War. Spain: Day 380 of 985 of the Spanish Civil War. CBI - China: Day 25 of 2,987 of the 2nd Sino-Japanese War. Day 25 of 33 of the 2nd Battle of Hebei. Day 18 of 22 of the Battle of Tainjin-Beijing. The Chinese troops defending Tianjin are ordered to withdraw. Spain: Day 745 of 985 of the Spanish Civil War. CBI - China: Day 390 of 2,987 of the 2nd Sino-Japanese War. Day 51 of 139 of the Battle of Wuhan. CBI - Russia: Day 3 of 14 of the Battle of Lake Khasan, a border dispute between the Soviet Union and Japan. Japanese 19th Division and Manchukuo units defeat the Soviet 39th Rifle Corps during the night. CBI - China: Day 755 of 2,987 of the 2nd Sino-Japanese War. Day 48 of 68 of the Battle of Tianjin. CBI - Mongolia: Day 82 of 129 of the Battle of Khalkhin Gol, a border dispute between the Soviet Union and Japan. 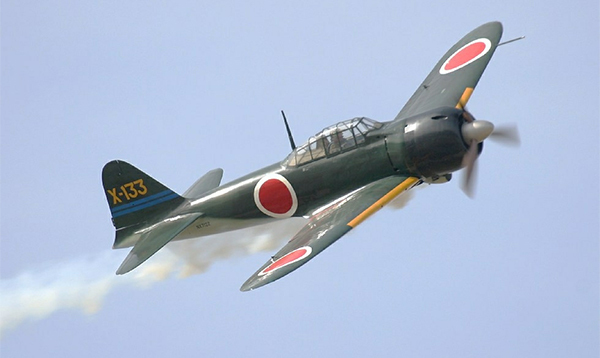 PTO - Japan: Mitsubishi delivers the first production of A6M "Zero" fighters to the Japanese Navy. Over 11,000 variants will be produced. used in the 2001 film "Pearl Harbor"
The A6M is universally known as the "Zero" from its Japanese Navy type designation, Type 0 Carrier Fighter, taken from the last digit of the Imperial year 2600 (1940). In the official designation "A6M" the "A" signified a carrier-based fighter, "6" meant it was sixth such model built for the Imperial Navy, and "M" indicated the manufacturer, Mitsubishi. The official Allied code name was "Zeke," in keeping with the practice of giving male names to Japanese fighters, female names to bombers, bird names to gliders, and tree names to trainers. "Zeke" was part of the first batch of "hillbilly" code names assigned by Captain Frank T McCoy of Tennessee, who wanted quick, distinctive, easy to remember names. At the time of the attack on Pearl Harbor, 420 Zeros were active in the Pacific. The carrier-borne Model 21 was the type encountered by the Americans. Although the Zero quickly gained a fearsome reputation, Allied pilots soon developed tactics to cope with it. When the powerful Lockheed P-38 Lightning, Grumman F6F Hellcat, and Vought F4U Corsair appeared in the Pacific theater, the A6M, with its low-powered engine, was hard-pressed to remain competitive. Atlantic: German sub U-99 sinks the British ships JAMAICA PROGRESS and JERSEY CITY 50 miles north of Ireland. Atlantic: German armed merchant cruiser PINGUIN sinks the British ship DOMINGO DE LARRINGA in the South Atlantic, 1,000 miles east of Pernambuco, Brazil. ETO - UK: Day 22 of 114 of the Battle of Britain. The Luftwaffe decides to start bombing more inland targets rather the in the Channel so they can destroy the RAF. ETO - Sweden: Crewman of a British Hudson, shot down over Norway on 11 Jun 40 and crossing into Sweden, is sent back to England. East Africa: Day 52 of 537 of Italy's East African campaign in the lands south of Egypt. CBI - China: Day 1,121 of 2,987 of the 2nd Sino-Japanese War. Day 260 of 381 of the Battle of South Guangxi. South America: Day 27 of 27 of the Ecuadorian-Peruvian War, a territorial dispute between Peru and Ecuador. An Ecuadorian-requested cease-fire goes into effect, thus ending the first of three military conflicts between the two nations during the 20th century. ETO - Norway: Reichskommissar Joseph Terboven declares a state of emergency in Norway. Germany: Goering instructs Reinhardt Heydrich to prepare the Final Solution to the Jewish question. Russian Front - Finland: Day 33 of 142 of Operation SILVER FOX, a joint German-Finnish campaign to capture the Russian port of Murmansk in the Arctic. Russian Front - Finland: Day 31 of 140 of Operation ARCTIC FOX, a joint German-Finnish campaign against Soviet Northern Front defenses at Salla, Finland. Russian Front - Finland: Day 40 of 164 of the Battle of Hanko. Russian Front: Day 40 of 167 of Germany's Operation BARBAROSSA, the invasion of the USSR. Russian Front - North: Army Group North, which is slowly advancing toward Leningrad, reaches Lake Ilmen, south of Novgorod. However, they are very fatigued due to the marshes and heavily wooded terrain. Russian Front - Center: Day 26 of 31 of the 1st Battle of Smolensk, Russia. German troops continue crushing the Smolensk pocket. Russian Front - Center: Day 8 of 38 of the Battle of Gomel, Belarus. Russian Front - South: Day 17 of 25 of the Battle of Uman, Ukraine. Romania: Romanian leader Ion Antonescu formally accepts Hitler's request for Romanian troops to conquer and occupy the Ukrainian territory between Dniester and Bug Rivers. MTO - Libya: Day 113 of 256 of the Siege of Tobruk. East Africa: Day 417 of 537 of Italy's East African campaign in the lands south of Egypt. CBI - China: Day 1,486 of 2,987 of the 2nd Sino-Japanese War. Atlantic: Hudson 625, a Hudson light bomber of No 113 Squadron RCAF, becomes the first aircraft of the RCAF's Eastern Air Command to sink a German sub, when it sinks U-754. ETO - Germany: The RAF night bombs Düsseldorf. Germany: 1,000 Jews from Theresienstadt Concentration Camp are taken to Baranowitsche Concentration Camp in Poland, but are gassed en route in vans. Russian Front - North: Day 327 of 872 of the Siege of Leningrad. Russian Front - North: Day 88 of 658 of the Siege of the Kholm Pocket. Russian Front - Center: Day 2 of 64 of the 1st Battle of Rzhev-Sychevka, Russia. German Army Group Centre near Rzhev begins fighting their way of the encirclement. Russian Front - South: Day 34 of 150 of Germany's CASE BLUE, the failed offensive to take the Caucasus oil fields. Russian Front - South: Day 9 of 20 of Germany's Operation EDELWEISS. German Army Group South continues heading toward the northern Caucasus. East Africa: Day 88 of 186 of the Battle of Madagascar. CBI - China: Day 1,851 of 2,987 of the 2nd Sino-Japanese War. Day 78 of 124 of Japan's Zhejiang-Jiangxi Campaign, launched to punish anyone suspected of aiding the Doolittle raiders in China. Roughly 250,000 Chinese will be killed. Japanese warplanes attack the airfield at Hengyang, from which the 10th Air Force flies out to harass the Yangtze Valley. PTO - Alaska: Day 55 of 435 of the Battle of Kiska, Aleutian Islands. PTO - Malaya: Day 163 of 357 of the Battle of Timor Island. PTO - New Guinea: Day 11 of 119 of the Battle of the Kokoda Track. 5th Air Force provides air support. PTO - Solomon Islands: US 5th Army Air Force begins a 7-day bombardment against Tulagi and the north coast of Guadalcanal where the US invasion forces will be landing. ETO - France: US 8th Air Force: B-26s attack 4 airfields in France. Russian Front - North: Day 692 of 872 of the Siege of Leningrad. Russian Front - North: Day 453 of 658 of the Siege of the Kholm Pocket. Russian Front - Center: Day 27 of 50 of the Battle of Kursk, Russia. Russian Front - Center: Day 20 of 38 of the Battle of Orel, Russia. Russian Front - South: Day 9 of 23 of the Battle of Belgorod, Russia. Russian Front - South: Day 19 of 48 of the USSR's Lvov-Sandomierz Offensive. Soviet troops continue attacking at Sandomierz. MTO - Italy: Day 23 of 40 of the Battle of Sicily. RAF and US Air Forces provide air support. The British meet heavy resistance west of Regalbuto. CBI - China: Day 2,216 of 2,987 of the 2nd Sino-Japanese War. PTO - Alaska: Day 420 of 435 of the Battle of Kiska, Aleutian Islands. PTO - New Guinea: Day 101 of 148 of the 2nd Battle of Lae-Salamaua. US 5th and 13th Air Forces provide air support. PTO - Solomon Islands: Day 42 of 67 of the Battle of New Georgia. US 5th and 13th Air Forces provide air support. Allied troops close in on an airfield at Munda. ETO - UK: Day 49 of 86 of the V-1 "Buzz Bomb" offensive on Britain. ETO - France: Day 7 of 29 of the Breakout Battle of Normandy. Day 7 of 7 of Operation COBRA. The initial objectives for this operation have been met. The US has advanced 35 miles inland and taken 20,000 prisoners since the 25th of July. The US captures Avranches. The British begin Operation BLUECOAT, an assault toward the river Vire. ETO - France: Day 56 of 62 of the Battle of Caen. Canadian troops continue attacking south of Caen. Russian Front - Finland: Day 6 of 19 of the Battle of Ilomantsi, North Karelia. Russian Front - Finland: Day 41 of 50 of the Battle of Karelia. Soviet troops continue their offensive against the Finns in eastern Karelia between Lake Ladoga and Lake Onega in northern Russia. Russian Front - North: Day 181 of 191 of the Battle of the Narva Isthmus, Estonia. Day 7 of 19 of the Battle of Tannenberg Line, Estonia. The Germans continue holding the Sinimaed Hills west of Narva. Russian Front - Center: Day 27 of 27 of the Battle of Siauliai, Lithuania. Soviets capture Siauliai. Russian Front - Center: Day 4 of 32 of the Battle of Kaunas, Lithuania. Russian Front - Center: Day 14 of 16 of the Battle of Lublin, Poland. CBI - Burma: Day 149 of 166 of the UK's Operation THURSDAY. US 10th Air Force provides air support. CBI - Burma: Day 144 of 147 of the Battle of Myitkyina. US 10th Air Force provides air support. CBI - Burma: Day 122 of 302 of the Chinese Salween Offensive. US 14th Air Force provides air support. CBI - China: Day 2,582 of 2,987 of the 2nd Sino-Japanese War. Day 106 of 259 of Japan's Operation ICHI-GO. Day 40 of 48 of the Battle of Hengyang. US 14th Air Force provides air support. PTO - Dutch New Guinea: Day 30 of 61 of the Battle of Noemfoor. Although the island has been declared secured, bitter fighting from Japanese continues. PTO - Mariana Islands: Day 8 of 9 of the Battle of Tinian. US 7th Air Force provides air support. PTO - Mariana Islands: Day 11 of 21 of the 2nd Battle of Guam. US 7th Air Force provides air support. Although this battle is declared as completed, it'll be a while before it's really over. PTO - New Guinea: Day 66 of 83 of the Battle of Biak. There are still 3,000 Japanese soldiers on the island who won't give up. PTO - New Guinea: Day 230 of 597 of the Battle of New Britain. US 13th Air Force provides air support. PTO - New Guinea: Day 101 of 481 of the Battle of Western New Guinea. 5th Air Force provides air support. PTO - New Guinea: Day 48 of 80 of the Battle of Lone Tree Hill. PTO - New Guinea: Day 22 of 47 of the Battle of Driniumor River, a failed Japanese offense on US troops near Aitape. PTO - Solomon Islands: Day 274 of 295 of the Battle of the Bougainville Islands. US 13th Air Force provides air support. France: The French collaboration trials so far have resulted in 1,629 death sentences, 757 hard labor for life, 5,328 other hard labor, 1,136 solitary confinement, 11,073 prison sentences, 22,137 to suffer national degradation and 3,564 acquittals. Austria: Former French Prime Minister Pierre Laval surrenders in Austria. CBI - China: Day 2,947 of 2,987 of the 2nd Sino-Japanese War. US 14th Air Force bombs supply convoys moving through the Siang Chiang Valley. CBI - Singapore: A British midget submarine sneaks into the harbor of Singapore and sinks the Japanese heavy cruiser TAKAO. PTO - Borneo: Day 52 of 67 of the Battle of North Borneo. US 5th and 13th Air Forces provide air support. PTO - Korea: A Navy PB4Y destroys a bridge on an important railway in Korea. PTO - New Guinea: Day 582 of 597 of the Battle of New Britain. US 10th Air Force provides air support. PTO - New Guinea: Day 466 of 481 of the Battle of Western New Guinea. US 10th Air Force provides air support. PTO - Philippines: Day 284 of 299 of the 2nd Battle of the Philippines, aka the Liberation of the Philippines or the Philippines Campaign. PTO - Philippines: Day 229 of 244 of the Battle of Luzon. The battle is said to over but hold-outs will continue fighting until the end of the war. PTO - Philippines: Day 144 of 159 of the Battle of Mindanao Island. The battle is said to over but hold-outs will continue fighting until the end of the war. A Zero crashed on tiny Akutan Island in the Aleutians on June 4, 1942. It lay there for five weeks until spotted by an American plane. Hauled back to California, the Zero revealed its secrets in a series of tests and analyses. The true story of a bunch of tough-as-nails drivers who, during three pivotal months of WWII, operated the Red Ball Express, is told through firsthand accounts.